The Valentine’s Day Sale is happening right now at ThinkGeek Canada. You can save up to 80% off on 100+ items, including bags & backpacks, electronics & gadgets, clothing, accessories, and more! This offer is online exclusive, and is valid for a limited time only. 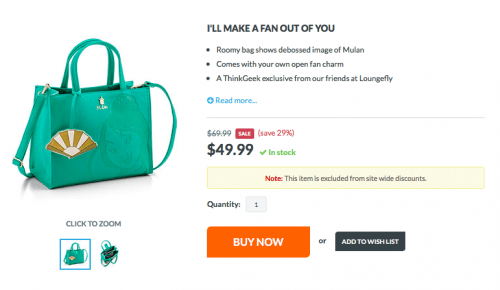 This New Disney Mulan Debossed Faux Leather Satchel Bag is on sale for only US$49.99. You’re saving $20.00 from the original price of $69.99! Featuring Mulan’s image and name, a small temple, and an open fan to obscure your own intentions, this roomy satchel bag will come in handy as you ward off any invasions in your own life. ThinkGeek Canada offers shipping to Canada with shipping and handling rate at $12.95. ThinkGeek prices are in USD. Click here to start shopping at ThinkGeek Canada.